Our hotel was steps away from the Tuileries. It was where we started our day, often ate breakfast, and planned our excursions. Full of families, tourists and locals taking a mid-day respite...the living room of Paris. We instantly fell in love with the Luxembourg gardens. Grand vistas surrounded by intimate garden rooms. The French must have a deal with Mother Nature...they have such command of their landscape. A place we have vowed to return. 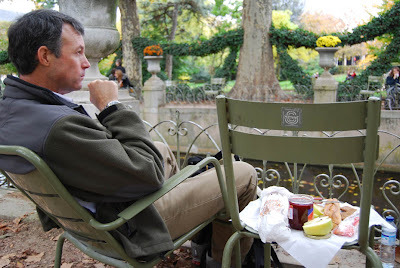 After discovering it on our first day we returned for a picnic lunch our last afternoon to bid au revoir to Paris. The serenity only interrupted by a celebrity sighting...Ron Howard and and his wife out for a jog. I managed to put down my baguette and squeak out "bonjour" as they passed by. A hidden gem screened from the busy city by an arcade of shops and cafes. Formal gardens showcasing Auguste Rodin's sculpture. More on his work in upcoming post.